We spent last week in Southampton with friends that we have known for many years. 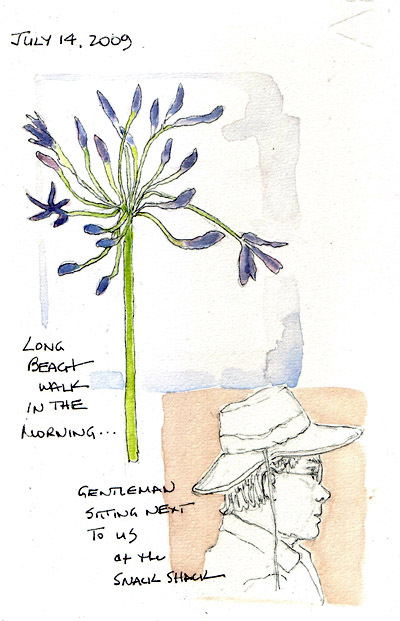 Each morning our group of 6 went for a two mile walk along the beach, enjoying the beautiful weather, watching the activity of the gulls, and collecting "treasures" to be sketched. There were very few shells, in contrast to the same week last year. 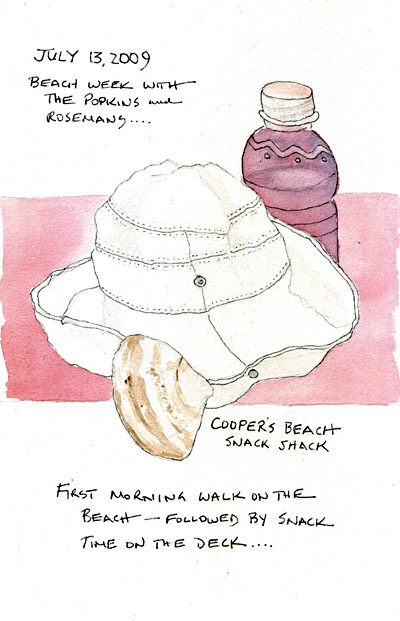 After our walk, we sat at the Snack Shack, had breakfast, and sketched our Still life of treasures. 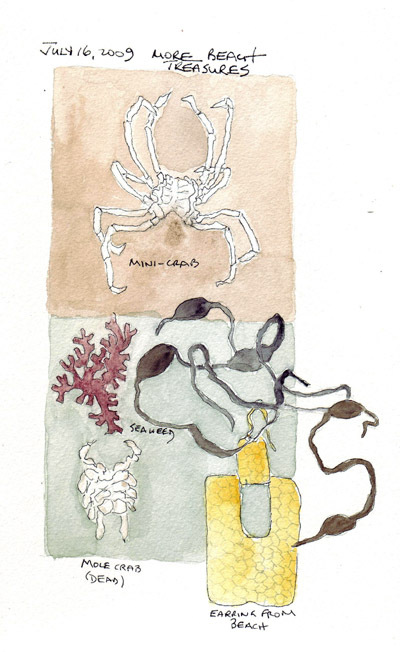 Clockwise: Gull feather, skate egg sack, moon snail, crab claw, and small crab shell. 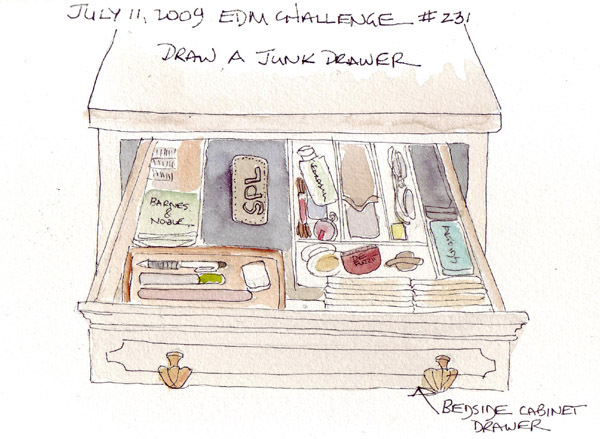 This is the inside of the junk drawer in my bedside cabinet - SIMPLIFIED! In the basket on the left front one pen represents about 50, one highliter about 12, one emery board about 6. On the right front are individual packets of yearly Filofax calendar pages from 1993 through 2008. The black leather zipper case in the back contains some information about renting apartments in Europe. The compartments on the right back are in a plastic silverware drawer insert and contain much more stuff in each section. On the far right back is an old Altoids tin and a pen case full of fountain pens that I love but no longer use! 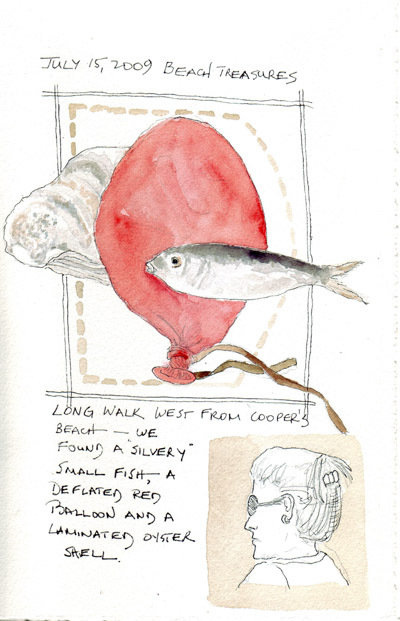 I painted sketchbook pages 6 and 7 from our sketchcrawl on Thursday - but will probably leave page 8, the tortoise and the skink, as is. The Snow Leopard is one of two introduced to the Zoo this past Spring and we were extremely lucky to have her moving around her enclosure and for a short while sitting on a ledge directly in front of us. As she jomped from rock to rock, frequently jumping up another level in the process, you sensed what powerful animals they are. 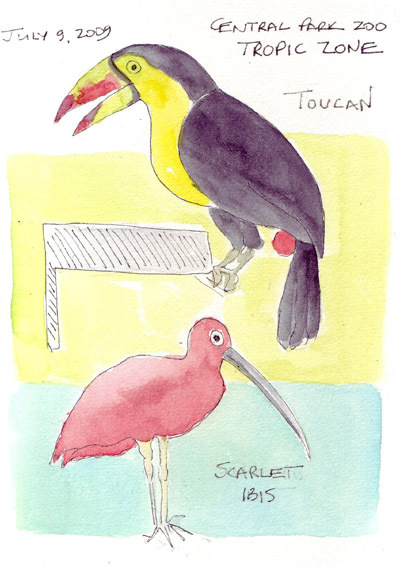 We ended our sketching in the Tropic Zone - a huge enclosure that is so full of tropical birds and other animals that you need to pay attention to see all but the most brightly colored. Here are two of those. I can't look at a Toucan without conjuring up a Fruit Loops box on our breakfast table. 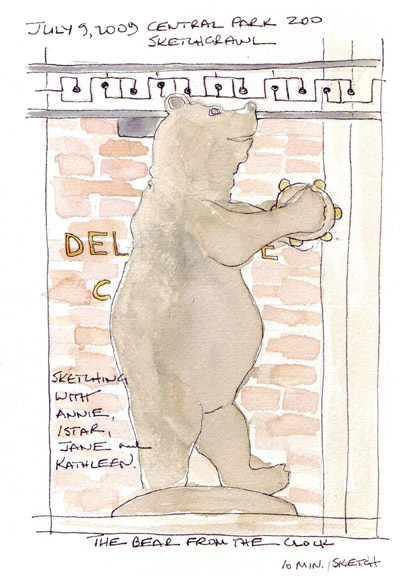 Yesterday I met 4 "Art Buddies" at the Central Park Zoo for our own mini-sketchcrawl. 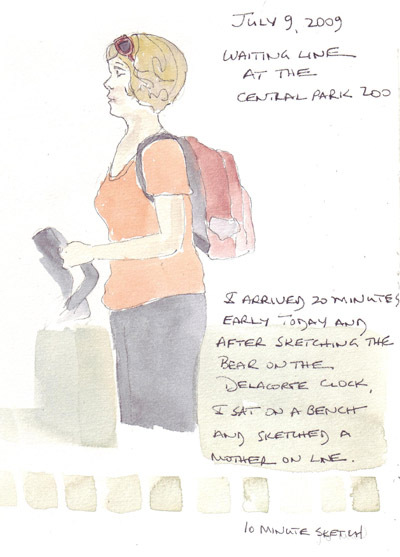 I was very unsure about my ability to sketch moving animals so when I arrived 20 minutes early, I did a 10 minute sktech of one of the animal sculptures on the Delacorte Clock and then a 10 minute sketch of a mother standing in line with a double stroller and backpack. These were my warm-ups! 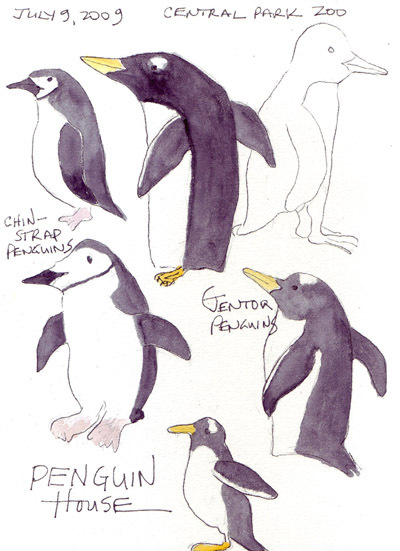 When everyone arrived, we went to the Penguin House, where the Chin-Strap and Gentoo penguins were being hand fed. It was difficult to sketch these frisky guys. I took some photos to make sure that I remembered the coloration, and finished them at home. 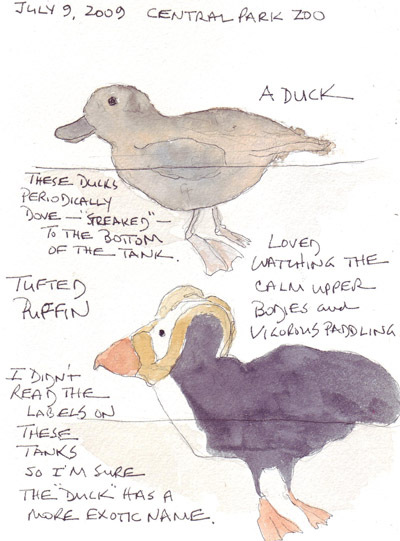 There was also a tank with several tufted puffins and ducks in the Penguin House and I sketched them from an angle where I could see above and below the water line. They were never still long enough for me to see the effect of the water line on their images, so I ignored the refraction error. But I also took no photos so adding a watercolor wash at home this morning was difficult. 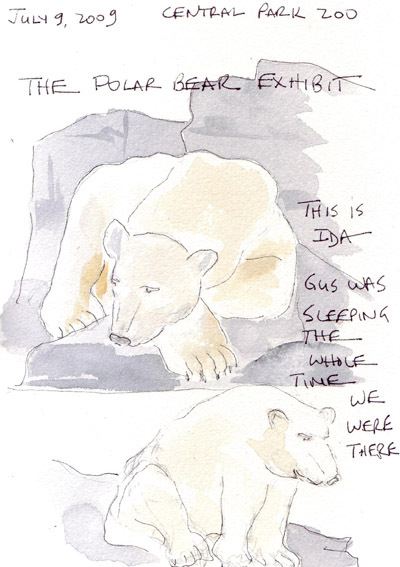 The polar bears were very cooperative - Gus slept the entire time and we couldn't see him very well. Ida stayed in several positions long enough for all of us to sketch her. 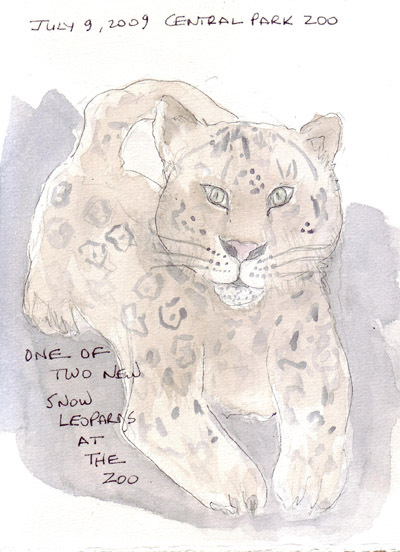 I still have 3 more pages of sketches to paint at home, including the newest member of the Zoo - the snow leopard. It was an amazing day - sunny, cool, and lots of fun to be with 4 other women who all were equally challenged and enjoying the experience. Last Tuesday was my last official workday, 40 years after I graduated from Medical School. I made this trip from my apartment on the Upper Eastside of Manhattan to Albert Einstein College of Medicine regularly - and was always amazed that driving 10 miles against rush hour traffic in the City took me almost 40 minutes from door to door. Of course I first needed to walk from my apartment to our garage - stopping at the fruit and vegetable vendor on the street to get fruit for breakfast. Then I always stopped to talk with the Garage supervisor about her newest baby. At the other end, I walked several blocks from the parking garage to my building - checking out the flowers that were in bloom or following the progress of autumn leaves or new buds in the Spring. 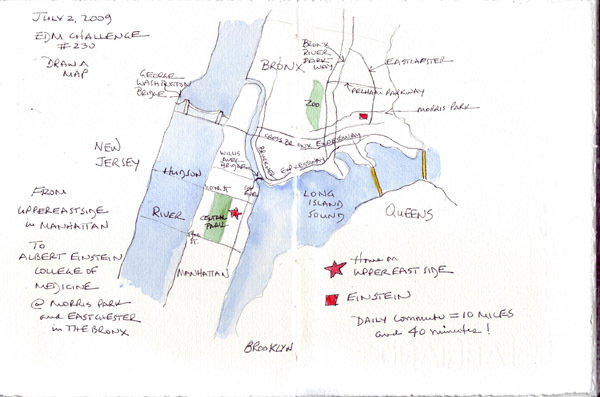 I love drawing maps and started each of my 3 London sketchbooks with ever more detailed maps of the area in Chelsea where my daughter and her family lived. 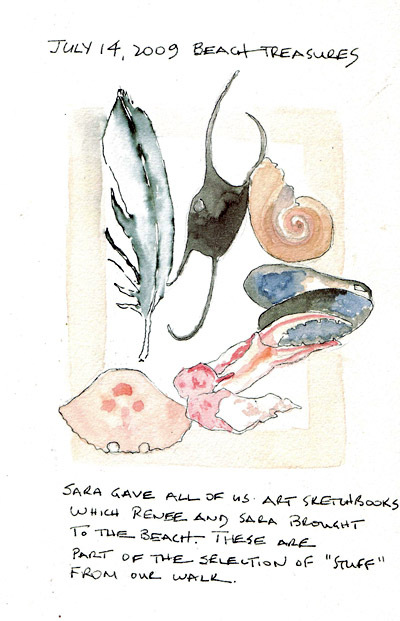 We just returned from a Family Holiday at the Beach - and I need to scan and post at least one sketchbook page from our visit.